The gist of the article is that the pressures of search engine optimization have compelled us all to throw around a superlatives (best, easiest, etc.) a little too liberally. These titles may speak the truth, but they might also be more strategic than honest, which means that it’s still a reader’s job to sift through mountains of content and find recipes that truly are “the best” (or just very good). To prove the point, Food52‘s editors did a taste test of numerous loaves of banana bread, each of which touts, if not the label of “best,” a claim to being definitively good. In truth, I can’t say for sure what makes a recipe worthy of that word. I’m not expert enough to have developed a criteria. But I know that this bread has been adored by everyone I’ve ever shared it with. I know that, while it’s baking, it makes your kitchen smell exactly the way banana bread should (like bananas, cinnamon, and burnt sugar). I know that it’s been tested many times over, in pretty much every kitchen I’ve cooked in as an adult, and that it has proven itself to be sturdy and reliable. I know that it features simple, cherished banana bread ingredients: flour, brown sugar, mashed bananas, vanilla, a (very) little milk. Cinnamon. Walnuts, if you like. And for all of these reasons, this feels like classic vegan banana bread to me. And I’m very happy to be sharing it, inexplicably late in my blogging game, with all of you. 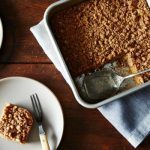 This recipe is perfect for those of you who are new to the world of vegan baking, or for novice bakers in general. There’s not much you need to be particularly wary of here, except that the bananas should be very, very overripe (the spottier, the better!) and that you shouldn’t overmix the batter. Other than that, the recipe takes care of itself, resulting in thick, moist, fragrant slices of banana bread goodness. Steven declared this “perfectly sweet” the first time he tasted it, and noted that it seemed to be just the right amount of crumbly. I have to agree–or else it wouldn’t be the recipe that I come back to again and again, in spite of playing with new formulas and ratios. The time may actually be just right for posting a recipe that is–to me, anyway–something of a classic. Over the years, I’ve experimented with a lot of alternative baking flours and techniques, and I love the creativity that this has fostered. Lately, though, I find myself returning to simple baking recipes and time-honored flavor combinations. And it doesn’t get more time-honored than this. Preheat your oven to 350F and lightly oil a standard size loaf pan. Pour the almond or soy milk into a bowl and add the apple cider vinegar. Add the oil, sugar, mashed banana, and vanilla extract to the non-dairy milk and vinegar. Whisk to combine. Add these wet ingredients to the dry ingredients and mix till everything is evenly combined. Don't over-mix; some clumps are OK. Fold in the walnuts, if using. Pour the batter into your prepared loaf pan. Sprinkle with extra walnuts, if you like. Bake the bread for 38-45 minutes, or until the top is golden brown and a toothpick inserted into the cake comes out mostly clean. Transfer the loaf to a cooling rack and allow it to cool for 15-20 minutes. Gently remove the loaf from the pan and allow it to cool to room temperature before cutting into slices and enjoying. Leftovers: Leftover banana bread slices can be wrapped individually and stored in the fridge for up to 4 days. The banana bread can be frozen for up to 1 month. It makes a great gift! Gluten free option: The best results I've had for making the bread gluten free are to use a combination of ⅔ cup sorghum flour, ⅔ cup superfine brown rice flour, ⅓ cup tapioca flour, ⅓ cup potato starch, and 1 pinch xantham gum. You can also use a GF, all purpose flour (such as Bob's Red Mill 1-to-1), but the homemade flour blend results in a lighter texture. I can understand the urge to use superlatives for recipes–even apart from the practical, SEO considerations. If you’re passionate about food (and most food bloggers are), then it’s hard not to speak with exclamations when a recipe turns out to be not only as good as you’d hoped, but better; the best, even, that you’ve ever tried. It’s a special moment for a home cook. None of us can go out and taste all of the recipes that ever were for a particular dish, and so we might not be able to say for sure what’s best and what isn’t. Plus, there’s the issue of subjectivity: as I’m learning through my cookbook testing process right now, tastes differ, plain and simple. The world’s “best” fudgy brownies probably won’t be all that appealing to a cakey brownie person. But we know what tastes best to us. We know when we’ve struck gold, so to speak, with a particular set of ingredients and quantities. We know when our many frustrating attempts to perfect a recipe have finally paid off in the form of a dish that we know we’ll treasure and keep for a long time. When we talk about a recipe in glowing terms, we’re really just communicating our own, unique tastes. In the end, that’s what keeps the world of food blogging vibrant and interesting. So, I can’t say for sure if this is the best vegan banana bread you’ve ever tasted. But I can tell you that it’s my favorite. I can promise you that it has served me very well. And I hope it gives you some of the happiness it often gives me. Nothing can ever beat the classic banana bread! My favorite thing my mom used to bake (the only thing she baked!) but it was so comforting! Such a good point about how SEO has changed the creativity of recipe titles. There really is so much to think about now! And banana bread is always a great comfort food; I remember the smell of my mom baking banana and pumpkin bread while I was still in middle school. Once again, you have created and shared just the type of recipe I love. 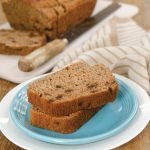 Banana bread was always one of my favorites and yours most certainly deserves the title “classic”. Simple, straightforward with ingredients that are already in the kitchen. Now was the perfect time for you to share it. Thank you. I’m going to bake it in my cast iron skillet because I don’t have a loaf pan and can’t wait to try it! Now that it is getting colder, baking bread or cakes sounds very heart warming. Your bread looks rustic and aromatic in the pictures, and I am sure it tastes good too. Being single and working for an events promotion company in London, where we have lots of food related events, I end up eating out a lot. But tonight, it is baking time! Cannot wait to get fingers into my banana bread! That looks insanely good. I’m going to try this. I did a zucchini bread two weeks ago that didn’t turn out so well. Well said! There is no way to taste everything that ever was or will be so superlatives shouldn’t really bother you. It might be a fantastic treat to you and a horrible one to someone who doesn’t like bananas. Not everyone will be a fan but we shouldn’t let that stop our excitement. Update on my previous comment: It works! Baking this bread in my 10″ cast iron skillet for 35 minutes worked perfectly! (A few chocolate chips accidentally fell in some how, but they didn’t seem to ruin it.) Five stars are not enough. Can’t tell you how happy I am to hear it was a success, Julia! This recipe is incredible ! Best banana cake ever !! I can almost smell the banana reading this recipe I am looking forward to making this, just hope no-one eats the bananas before they are ready. I am head over heels for this banana bread. I added a handful of chocolate chips and millet (an idea I picked up from Smitten Kitchen), and I would honestly choose the resulting crackly-chocolatey magnificence over “fancier” desserts. I have a question, though – I have an abundance of pears and I’m wondering if I can substitute pear puree for the mashed bananas. Have you ever tried substituting fruit purees for mashed bananas in this recipes or others? Do you know if it would work with a direct 1:1 swap, or if I’d have to do some more tweaking (decreasing liquid, etc)? Thanks for such a wonderful recipe. I haven’t tried it with other fruit purees, so I’m sorry to say that I’m not really sure. I think pear puree would be a little more “liquidy,” so I’d suggest using slightly less. But you can also see how the batter looks after mixing: so long as it is close to the banana bread batter in appearance, you should be OK! Love love love this recipe! 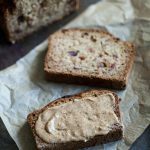 I’ve been trying a different banana bread recipe each weekend, and this one is so simple and tastes delicious! I can’t believe I haven’t left a review for this banana bread! It’s my all-time favorite. I’ve made it a bunch of times, which is unusual for me because I don’t bake much. It is very moist with lots of banana flavor. I’ve taken it to holidays and given it as presents. It always goes over well. Perfect banana bread recipe, simple to make with just the right amount of sweetness. Exactly what I was looking for. I will definitely make this recipe again! So glad that you enjoyed, Suzanne!